Welcome to my selling blog - FROM A SIMPLER TIME! 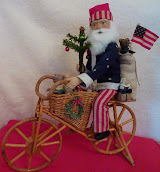 Here you will find primitive handmade Santa figures and other folk art treasures created by me - Joyce Cressi. Stop by often to see my latest creations and click on the link under each picture to purchase an item. 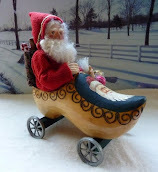 Tonight I am listing four new Christmas items for sale. Click on the link under the picture to purchase. This Santa is being listed on ebay tonight. He is awesome! Check him out by clicking on the link under his picture! This little Santa pillow is adorable! It's also headed to ebay tonight. Click on the link under the picture to purchase. This is the only Santa on his reindeer that I will make this Christmas season. If you would like to purchase it, click on the link under the picture. Thanks for stopping by and please check in often to see my folk art "FROM A SIMPLER TIME"
Please contact me at fromasimplertime@gmail.com.